Outrun 2 is the updated version of the classic Sega game - Outrun. This newer Outrun 2 version is fully licensed and approved by Ferrari and allows players to fulfil their racing dreams by driving their choice of 8 different classic Ferrari's. Ferrari cars included are Enzo Ferrari, Dino 246 GTS, 365/4 Daytona, Testerossa, 360 Spider, 288GTO, F40 and F50. Players can drive their dream car around 16 different routes each with it's own unique and fascinating landscape all created with the enhanced graphical support of the Sega CHIHIRO system. Starting from 1 position, passing through 4 diverging points to finish at 5 different goals. Players also get to choose their favourite background music from a choice of 6 tracks. There are now also 4 different driving modes - Heart Attack Mode: The object of this mode is to win the heart of your beautiful passenger. To do this you will need to impress her with your driving technique. Do well and see her "Heart Gauge" rise. Perform good enough to get the hidden special ending. OutRun Mode: This is an updated version of the original OutRun driving experience with updated graphics for the supreme driving experience. Time Attack Mode: In this mode you ditch your passenger and get down to some serious driving. Compete for the fastest track time - you'll get a password to enter your high score on the Internet ranking system. If you become the top ranked player for that route, then your car will appear as a Ghost car on the track for future players to try to beat. Endings will differ based on your performance. Versus Mode: An intense head to head battle for up to 4 people. The race leader gets to choose the routes that other must follow. 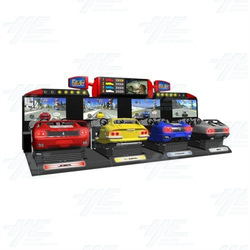 All of the action is enjoyed in a dedicated OutRun 2 SD cabinet with 62" monitors. Outrun 2 is the updated version of the classic Sega game - Outrun. This newer Outrun 2 version is fully licensed and approved by Ferrari and allows players to fulfil their racing dreams by driving their choice of 8 different classic Ferrari's. Ferrari cars included are Enzo Ferrari, Dino 246 GTS, 365/4 Daytona, Testerossa, 360 Spider, 288GTO, F40 and F50. Players can drive their dream car around 16 different routes each with it's own unique and fascinating landscape all created with the enhanced graphical support of the Sega CHIHIRO system. Starting from 1 position, passing through 4 diverging points to finish at 5 different goals. Players also get to choose their favourite background music from a choice of 6 tracks. Heart Attack Mode: The object of this mode is to win the heart of your beautiful passenger. To do this you will need to impress her with your driving technique. Do well and see her "Heart Gauge" rise. Perform good enough to get the hidden special ending. OutRun Mode: This is an updated version of the original OutRun driving experience with updated graphics for the supreme driving experience. Time Attack Mode: In this mode you ditch your passenger and get down to some serious driving. Compete for the fastest track time - you'll get a password to enter your high score on the Internet ranking system. If you become the top ranked player for that route, then your car will appear as a Ghost car on the track for future players to try to beat. Endings will differ based on your performance. Versus Mode: An intense head to head battle for up to 4 people. The race leader gets to choose the routes that other must follow. All of the action is enjoyed in a dedicated OutRun 2 SD cabinet with 62" monitors. Gameplay of the Outrun 2 driving arcade machine by Sega. This short video, captured straight from the machine gameboard in store at Highway Entertainment, shows gameplay in Outrun or Race mode.